Cheap flights to USA: New York for only €371! Delta and Bulgarian Air now offer cheap flights from Bulgaria to USA. 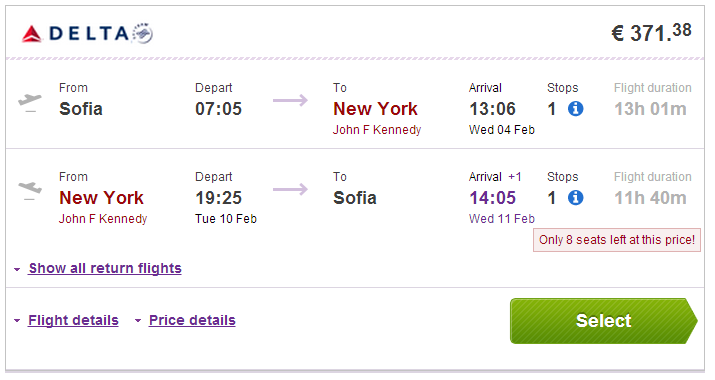 Return flights from Sofia to New York are available from only €371! This fare includes 23 kg check in luggage. Wizzair flies to Sofia from many airports in western Europe for low prices. Book via BudgetAir to get this price. « WOW! Cheap flights to Mauritius for just €440!